Purple to cranberry hue with aromas giving the classic Sangiovese bouquet on first whiff but then there is a blast of fresh fruit like candy apple cherry (the hard red coating on candied apples) with a rear guard of sweet herbs. This is a distinctive and enticing bouquet! Palate--It tastes a little confused to me with the Sangiovese (60%) fighting with the (40%) Syrah. There's a nice sense of pie crust with residual baked-on cherry juice on it, red berries, and a touch of dried red fruit. Finish lingers a bit. I had this wine several vintages ago and didn't care for it. It wasn't a bad wine at all it's just one of those preference things. 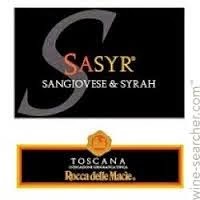 I like Sangiovese when it's a blend if its with Cabernet Sauvignon, but not so much with Syrah. That's just me. This wine has a lovely bouquet though. I see this around for anywhere from $9 on sale to $13. Just a word of warning--in these summer months, unless you have a temperature controlled cooler, don't drink this at room temperature unless your house is air conditioned and kept fairly cool. This wine changes dramatically as the temperature rises and the alcohol begins to engulf all else. This is true of any red wine and heat so don't be afraid to throw it in the refrigerator for 1/2 before you drink it and then raise a glass! By the way Rocca Delle Macie is pronounced ROH-kah DELL-eh mah-CHEE-ah!